I can only find this mentioned in the Italian news sites (in Italian) but basically it sounds like it is a super 8 color film that has never been shown to the public before. It is being presented in the Sala d'arme at the Palazzo Vecchio in Piazza Signoria, every day, for free, from from 11 a.m. to 7 p.m. until November 13. I can't find anything official about it on the Palazzo Vecchio website - many of these Florence museum websites are unfortunately woefully maintained. This is Florentine native Franco Zeffirelli's short documentary about the flood "Florence: Days of Destruction" which he made to raise awareness of the flood's impact. Released a month after the disaster, it reputedly raised more than $20 million for reconstruction efforts. The narrator is Richard Burton, speaking in Italian allegedly from a phonetic script. This is an interesting clip from YouTube that is a mix of some contemporary docudrama looking stuff mixed in with some vintage film of the 1966 flood and work of the mud angels. I am not sure where it was taken from. If you can shed some light on the origins of this please let me know in the comments. Here is some footage (1:42) of the Piazza Signoria on the night of the 40th anniversary of the flood. You can see the slideshow in the loggia and the purple lighting, etc. It was a very moving exhibit. We were there that night but only have still images. Originally produced by the Royal College of Art, London, 1968. Book conservators begin to restore the many books damaged by the devastating flood in Florence, Italy in 1966. Peter Waters covers a book in leather. Christopher Clarkson makes a velum binding. 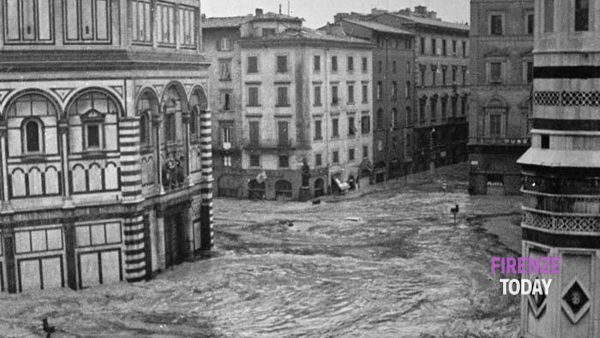 "Santa Croce was the first populated area to be overflowed by the flood. This area remained under the water longer compared to the others because it's lower with respect to the river. The Arno river completely filled the Cloister, it penetrated into the crypt, it disrupted the tombs of the Church. The works of removing the mud and the rubble took about two months. But the damages didn't finish here: the Franciscan fathers and those in charge of the Belle Arti saw the most devastating reality: the Crucifix by Cimabue, located in the Museum inside the big Franciscan refectory, was destroyed. Among great difficulties the heavy painted cross, drenched with water, was brought down and laid in a horizontal position. It took six hours to accomplish this difficult task, while the flakes of colour detached and fell in the mud. The mud was sieved and some fragments were recovered." 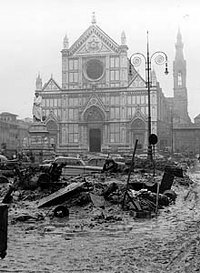 Getty Images has some archival footage of Florence right after the flood. You can watch the clips on their site - or if you are a film maker you can buy what you need for your project.